We take extreme care and utmost pleasure in designing your special day by introducing innovative ideas and totally new concepts. Our planning is very intricate and we get into details, declare timelines, structure and document every step. We ensure nothing is missed out!!! We consider on time completion as too late. Our champions ensure perfect delivery much before the scheduled time. Give your wedding guests a dramatic welcome with a unique entrance design! 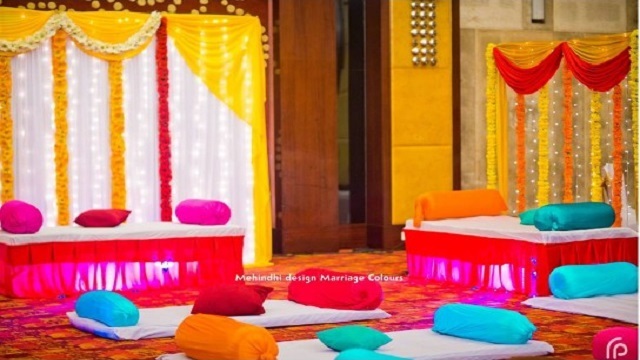 At Marriage Colours, the #1 Chennai Wedding Decorators, we help set the tone of wedding celebrations by creating exciting, elegant and memorable entryways that will be a delight to walk through. We focus on adding your unique personality to your wedding decoration to make it a true reflection of you. Our team of wedding decoration suppliers and vendors are experienced at full-on event design and styling, which helps us plan and create the perfect atmosphere for your unique wedding entrance decoration. As the best Chennai Wedding Decorators, we work with wedding decor stylists, designers and decor specialists who will come to your venue and set up the decoration exactly as you envisioned it to be. Your wedding entryway is the first glimpse that your guests get of your celebration and we will ensure that it sets the tone for your special day with our distinctive range of entrance decor ideas that will transform your event into an unforgettable experience for your guests. 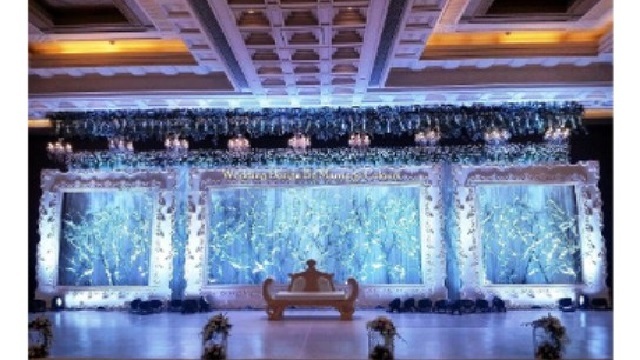 As the most unique of Chennai Wedding Decorators, we take care of things starting from custom lighting, monograms, patterns, flowers to dramatic draping we offer a wide range of fun, classic and colourful wedding entryway decoration solutions that will give your event a unique aura just as you had imagined. As one of the best Chennai Wedding Decorators, we ensure that you get a wide selection of creative options to choose from to make your wedding decoration truly exclusive. As best Chennai Wedding Decorators, whether you want your wedding entryway to be simple and elegant or luxurious and extravagant, we will craft the perfect entrance decoration for your celebration that will leave your guests awe-struck. As you know and appreciate, there needs to be a rhythm in every activity. The same rule applies to decoration too. Our team of experts plan and rehearse the entire journey right from the beginning. We even bring in numerology, astrology and the golden ratio into this, even though many may not agree or understand or may even be against it. We of course, do not reveal this but, at the end the client and the guests appreciation tells us that this has worked magic for the decor. We, being one of the leading Wedding Decorators in Chennai, try to understand the colours that are favourable for the bride and groom, the colours that lift their spirits and those that dull their senses. We carefully pick only from the list of colours and draw a theme based on the colours that are friendly on the basis of numerology and astrology. We also create the wedding decoration designs, carefully using the golden ratio to prune up the design for universal appeal. Do you want a durbar setting as your wedding stage decoration? A 20 feet golden facade with decorative arches with the bride and groom in the middle of the royal durbar like the prince and the princess at the royal wedding is the right ambience for the wedding of your loved ones. Do you want a wedding amidst a jungle? A wooden throne among dense forest ambience, as the wedding happens in a clearing in the jungle. The setting is perfect where even the smell of the jungle is not left out. Do you want a beach side ambience? Do you want the Taj Mahal ambience light up the stage with love fervour? The Taj scene with marble background and flooring that completely transforms your wedding hall into one that resembles a Mughal court. Every small detail like the Sultan's throne, where the bride and groom will rest, the surroundings and the guest chairs are all designed to reflect the Mughal setting for a complete experience. As leading Chennai Wedding Decorators, it is our duty to ensure that the guests take home the experience with them and discuss this for a long long time. Or do you want the Tirupati setting replicated at your wedding and let the Gods bless the children on their important day of their lives? 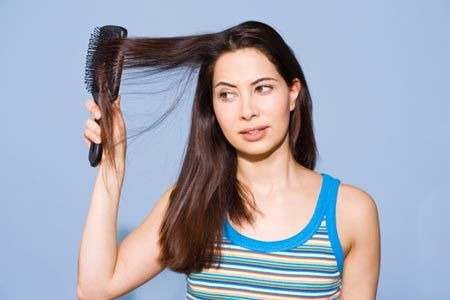 We leave no stone unturned to get you the right solution with the right look and feel. One other thing that we excel is working against time. Many projects on wedding decors in Chennai that we took up, may have given jitters even to the seasoned professionals in the industry. It is the sheer magnitude of the project that is unsettling to everyone, but a few. There have been wedding decorations in Chennai that would have taken other Chennai Wedding Decorators up to 3 months to complete, which we completed in half the time. On top of the size of the project, there is time. You are always running against time in most projects; there is always a time constraint. The requirement is there, but there is not enough time. But, we take up these assignments as our challenges to overcome. Take for example, the Tirupati temple tower assembly at the Confluence Banquets and Resorts, Chennai. The entire process was completed in a record 45 days, where it normally takes a minimum of 3 months for the job and completed setup in less than 15hrs. We hired the best professionals to recreate the gopuram using photographs of the original and fabricating bits and pieces, painting them individually, transporting them carefully from the factory site to the event site, touching them up and the final assembling of the parts into a massive structure. The entire structure was supported under solid steel and weighed over 4 tonnes. A huge crane was used for the final assembly. This tower near the lawn was the landmark throughout the event. While this was at the outside, the inside was a replica of the Tirumala temple, with the Lord of the Seven Hills and the mother Goddess capturing the attention of all the guests. The entire design and decoration was appreciated by the hosts as well as the guests who attended the wedding. Having a look at the videos and decoration photos for marriage taken at the venue, will give you an idea. 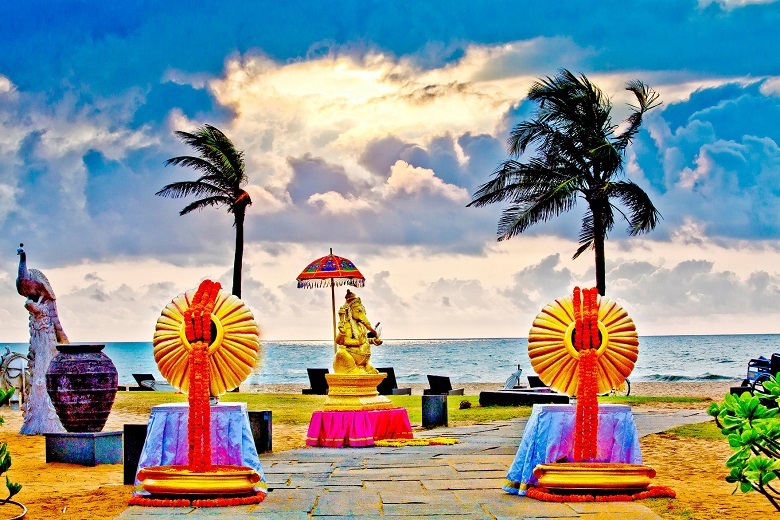 Wedding decorations in Chennai are not restricted to the hall where the function will happen. The entire compound will be decorated with the theme running like a thread all through the decorations. 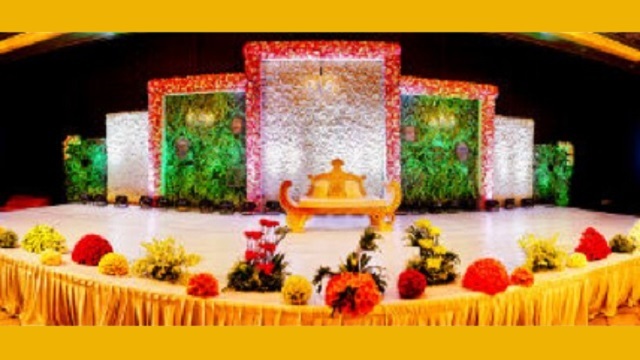 With the best of Chennai Wedding Decorators, right from the moment the guest enters at the main gate, till they leave the premises, the feel is created and stays on at every stage. 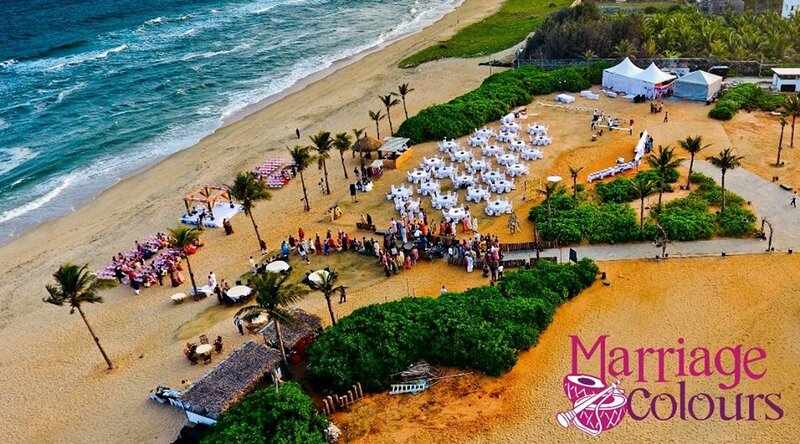 On the other hand, if you want a different ambience for every area of the wedding complex, that is also very much possible. 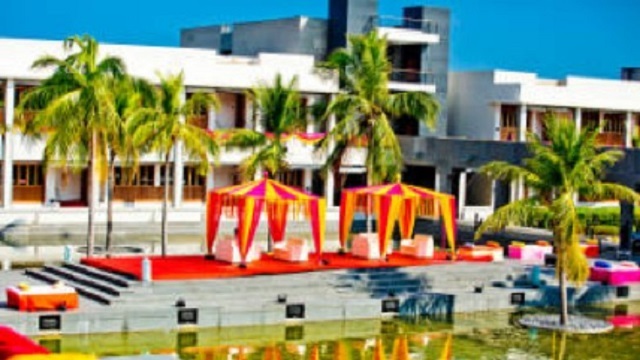 A contrasting decor and sets are created at different areas like the main mandapam, the dining area, the kids area and women's area, the lawn and music and dance stage, can each have a different ambience, for a contrasting kaleidoscopic experience for the guests, while they are bedazzled by the colourful fireworks that go along with the celebrations and at the end of the event. There are numerous decoration photos for marriage here for you to browse through. 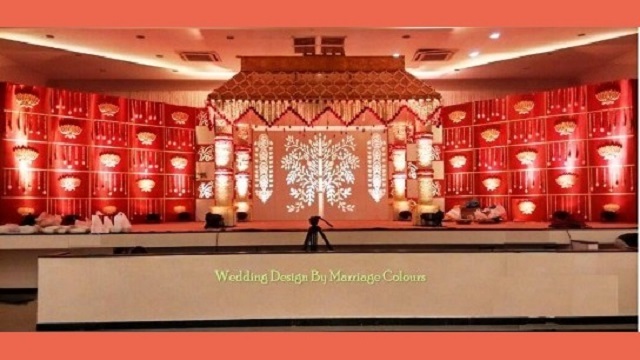 We have been Wedding Stage Decorators in hundreds of Chennai weddings and therefore you get to see a variety of wedding decorations, wedding stage decorations and quite a handful of decoration photos for marriage here at our portal. It is our job to inspire confidence in our clients, so they feel that not just the wedding stage decorations, but the entire wedding decorations in their chennai wedding will be taken care of by us. All our clients have only been too happy at the end of their event, because we set ourselves a target to excel ourselves, in every event that we undertake. It is our duty to provide the best wedding decors in Chennai for you. We feel that every new project is our first and we put in all our efforts to make it click and ensure that our client is happy. We are proud and happy that a few of our customers have been very vocal in their appreciation of our work, like Mr.Balakumaran, who said Marriage Colours recreated Indra lokam on stage. He was very generous in his appreciation and we are thankful for it. While we take up your project in right earnest, whether it be for decorations or for planning the entire wedding, we will lay down a carefully evaluated plan for the event right from the beginning to the end of the activity. As indicated elsewhere, we take pride in being systematic and taking into account all the smaller details in the run up to the activity, as we rehearse the event many times before the event. All these and the fact that we keep innovating constantly make us one of the leading Wedding Decorators in Chennai. Give your wedding a unique stamp with a wedding logo and monogram that will be talked about for a very long time to come. As our favourite decorators in Chennai, let us create a stunning brand for your love story that perfectly matches your unique bond. Give the focal point of your wedding a unique setting that will impress your guests. 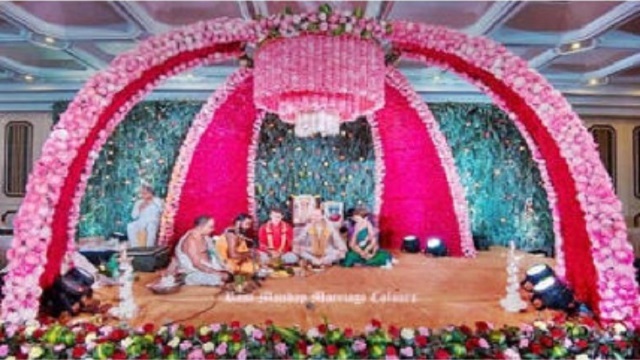 Let the best expert wedding stage decorators in Chennai create a striking backdrop for your wedding celebrations. Let your wedding venue reflect the uniqueness of your tastes and preferences. 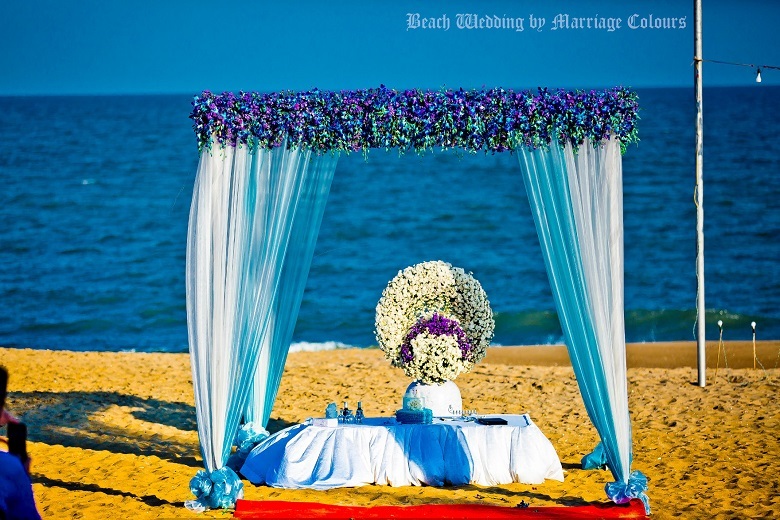 Give your wedding venue decorations the extra edge of elegance with our custom wedding venue decorators in Chennai. Light up your special day with unique and classic lighting fixtures that will create the perfect ambiance for your wedding. Let our wedding lighting design and decorators create the most memorable setting for you at the budget you have in mind. Define a unique ambience for your Sangeet Party and Mehndi celebrations with a functional, creative and boisterous decoration that will uplift the mood of the guests and lighten up their hearts and bring the feeling of joy and party mood in the area. Our sangeet party and mehndi decorators will ensure that your mood is elevated throughout the evening of celebrations. Give a seamless, cohesive themed look to your wedding celebrations with our unique decor ideas that will cover every essential wedding decoration element. You can choose from a wide range of options that covers wedding stationery to drapes, aisle runners and even wedding chairs to give your wedding decor a unique styling that reflects your distinctive tastes. Ask us, the premium wedding decorators in Chennai, to know how to make your wedding a one of a kind event.